Found in a dizzying array of processed foods and beverages, artificial sweeteners simulate the sweet taste of sugar without all the calories found in table sugar and other calorie-laden sweeteners, such as high-fructose corn syrup. 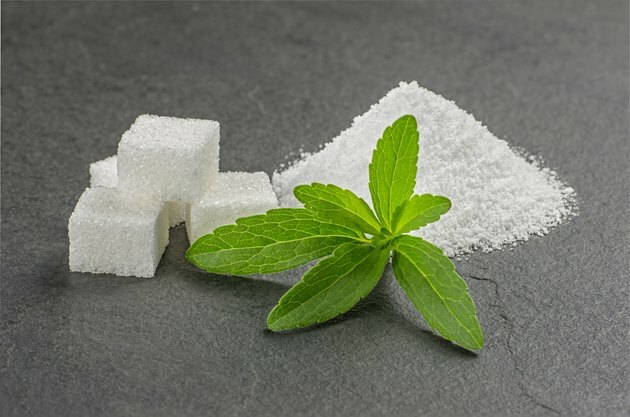 Also called sugar substitutes, artificial sweeteners are considered useful in fighting obesity, diabetes and metabolic syndrome, all of which are risk factors for heart disease. For these reasons, the American Diabetes Association and the American Heart Association give artificial sweeteners a somewhat cautious thumbs-up. But these sweeteners have some adverse effects, which you should carefully consider before beginning regular use of these sugar substitutes. The U.S. Food and Drug Administration regulates artificial sweeteners as food additives. Before they can be marketed in the United States, the FDA must carefully review and approve each of these non-nutritive sweeteners before adding it to its list of food additives that are generally recognized as safe, the so-called GRAS list. Currently approved for use by the FDA are acesulfame potassium, or ace-K, marketed under the trade names of Sunett, Sweet One and Swiss Sweet; aspartame, marketed as Nutrasweet and Equal; neotame, used in processed foods; saccharin, marketed as Sweet 'N Low and Sugar Twin; sucralose, marketed as Splenda; and stevia, marketed as PureVia and Truvia. Not all artificial sweeteners are created equal and thus appropriate as a substitute for sugar in all applications. Aspartame, for example, is not heat-stable and should not be used in cooking or baking. While ace-K, aspartame, neotame and sucralose are considered safe for pregnant women if used in moderation, saccharin and stevia are not yet approved for use by pregnant or lactating women. Aspartame carries a warning label cautioning against its use by people with PKU, a relatively rare metabolic disorder in which the body lacks the ability to properly break down the amino acid phenylalanine. Despite some advertising claims to the contrary, many consumers find that sugar substitutes leave a bitter aftertaste, some more than others. Behavioral neuroscientist Susan E. Swithers, a professor of psychological sciences at Purdue University, says that regular consumption of artificial sweeteners, particularly in beverages, not only leads to overeating but also appears to disrupt normal metabolism. Writing in the July 2013 issue of “Trends in Endocrinology & Metabolism,” Swithers says her review of relevant scientific literature shows that artificially sweetened foods and beverages interfere with a body’s learned responses that regulate energy and glucose homeostasis. Homeostasis is the ability of an organism or system to maintain equilibrium in response to environmental changes. Human metabolism covers literally thousands of the chemical reactions needed to sustain life, including the conversion of dietary nutrients into energy and the disposal of waste materials. Any disruption in these many processes could conceivably cause a slowdown in metabolic rate, which would have the unintended consequence of making it even more difficult to lose weight. Harvard Health Publications: Artificial Sweeteners: Sugar-Free, But at What Cost? What is a Sucralose Migraine?